George Keyworth is an Assistant Professor of East Asian religions. 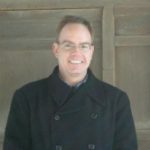 His research interests include Chinese Buddhism, Japanese Buddhism, Daoism, Shintō, and East Asian religious literature. He is specifically interested in Zen Buddhism in Medieval China and Japan, Buddhist and Daoist Spells in China and Japan, and Esoteric Buddhism in China, Japan, and Tibet.